Grommet, fuel filler neck. 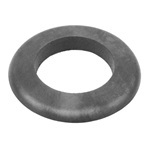 Fully molded rubber with retaining flange. Three and five eighths inch (3-5/8") outside diameter by two and one eighth inch (2-1/8") inside diameter by one inch (1") height. Grommet, fuel filler neck. Oblong, fully molded rubber. 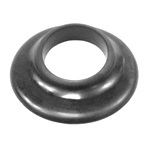 Four and one eighth inch (4-1/8") outside length by two and one fourth inch (2-1/4") inside diameter. Grommet, fuel filler neck. 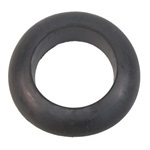 Fully molded rubber, slightly angled. 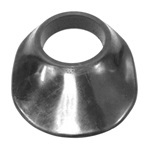 Four and one half inch (4 1/2") outside width by four and five eighths inch (4 5/8") outside length by two and one fourth inch (2-1/4") inside hole diameter. Grommet, fuel neck. 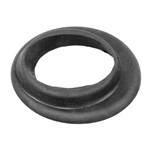 Fully molded rubber with retaining flange. Three and eleven sixteenths inch (3 11/16") outside diameter by two and one eighth inch (2 1/8") inside hole diameter by nine sixteenths inch (9/16") height.